This 1978 radio-theatre collaboration with vocalist Martine Viard may bear the imprint of Cage / La Barbara, but it’s intensely French. The texts seldom use coherent sentences or phrases, instead casting words as raw material for musical process — seeking related resonances (No. 1’s tresses / femme / elle / jeune) or accretion (No. 10’s fois / parfois / ej parfois / sa ej parfois). 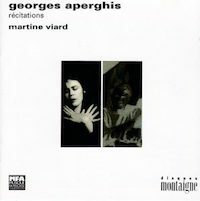 Viard’s astounding delivery provides both a valid musical line (attack, intonation, pace) and emotional sense. Aperghis notates rhythms exactly, but not always pitches. (The previous booklet included useful score samples, which I trust are still present.) Picking out highlights would be unwieldy, but I must mention No. 14 (the finale), in which Viard builds reiterations of heart / luth / cor / coeur / harp et seq. into a tearful confession. The short timing (38:09) reflects an original vinyl issue. I’d count the Arditti Quartet’s earliest (1989) Montaigne CD among their few serious misfires. The playing is stingy in expressive and tonal resources, and shows little insight into the music’s ancestry or sound universe. Clearly Berg’s precarious Romantic language doesn’t engage them. The LaSalle Quartet’s landmark Neue Wiener Schule box (DG 419 994-2) is essential, not least for its 340 pages of documentation. Otherwise, I’d stick with a trio of Viennese groups. The Alban Berg Quartet would have to succeed here, and the 1992 remake (EMI CDC 5 55190 2, import only) is less fussy and even finer than their mid-’70s statement on Teldec. Not far behind stand the Artis (Orfeo C 216 901 A). In 1935 the Galimir Quartet (violinist Felix and his three sisters) brought the Lyric Suite to records. Now on Rockport RR 5007, it’s more expansive (not slower) than the current fashion, and hard to dismiss. Surprisingly, these avant-garde monuments have fared well on CD. The dense, violent First Sonata (1946) put its 21-year-old creator on the map. His “anti-sonata” Second (1948) displays advances in technique, but seems much more calculated. The unfinished Third (1957-8) was to be Boulez’s response to the wave of interest in performer freedom. Its complex directions (“the map of an unknown city”) require from the pianist an intense mental effort that isn’t musically intuitive. Still, a few have accepted the challenge. Claude Helffer worked in Boulez’s group Domaine Musical, so this 1980 disc (previously on Astrée) can claim primacy over the later intégrales, from Henck (Wergo WER 60121-50) and Biret (Naxos 8.553353). (Its honest analog sound isn’t inferior to the others’ so-so digital.) In the Third Sonata, Helffer’s ordering of elements influenced the angle other players took. As in (say) Beethoven’s “32,” a complete edition from a single viewpoint leaves some things unsaid. It’s exciting when mainstream artists with formidable minds and fingers invade the specialists’ turf, and Pollini’s Second (DG 447 431-2) reigns supreme. Similarly, Jeffrey Swann (superb at Liszt) set down contrasting paths through the Third in 1993 (Music & Arts CD-763). Berkshire Record Outlet (www.broinc.com) still carries it. Sony could affect the picture by putting Charles Rosen’s 1973 lp of the First and Third (which gained Boulez’s approval) on CD. Odd to find this anthology at reduced rates — it’s barely two years old. The big attraction is the Fifth String Quartet (1994-5), dedicated to the Ardittis. For all the pointing to Carter’s layers of intricate activity, a clear scenario often drives events. The 20:26 length divides into 12 parts. Even-numbered ones boast gleaming surfaces, highly evolved gestures, and coalesce into a kind of unity. The rest (Introduction, and Interludes I-V) show the same materials in progress, but hint at “finished” sections just heard and yet to come. Genuine “brain music,” then (approaching the speed and permutations of thought itself), and the Ardittis have no equal at such arcane pattern-making. It’s a pity that this disc was finalized before Carter completed his Piano Quintet. The major couplings — the 1948 cello / piano Sonata and 1974 violin / piano Duo — have drawn more charismatic playing elsewhere, and the occasion-inspired miniatures remain side issues. The sound is properly immediate and a touch surgical. Here’s another Arditti CD whose main appeal rests with its opening work. In recent years, Dutilleux’s 1976 Ainsi la nuit (“Thus the Night”) has occasionally joined the standard Debussy / Ravel quartet pairing. Nocturnal images course through several of his primary orchestral pieces; here denied that range of timbres, he concentrates on motion — wispy formations continually expand or contract, to spooky or undercutting effect. Aided by a close-up, idealized recording, the Ardittis command the necessary purity and delicacy of tone, without losing sight of larger objectives. I retain great affection for the Rosamonde Quartet’s blend of detachment and sensuousness, but that 1991 disc (ADDA 581280) is long gone. The Juilliards (Sony SK 52 554) push harder than either of these. Despite the Ardittis’ exertions, young Pascal Dusapin’s Second and Third Quartets don’t reveal much personality. Time Zones (1988-90) tries out the entire catalog of coloristic acrobatics during its 24 episodes, which appear arbitrary and overlong. The Third (1992) has a conventional layout and inner slow movements of some finesse. But it’s all very familiar. Quality productions of Feldman’s vast chamber output hit often during the ’90s, and Ensemble Recherche’s fluent recital got little attention. From The Viola in My Life (1970) to Routine Investigations (1976), this is middle-period material — more approachable than the glacial (in chill and stasis) masterworks to come, but equally careful “to project sounds into time, free from a compositional rhetoric that had no place here.” The band moves confidently within Feldman’s aesthetic, and its performances stand up well to current alternatives. (Except for the Viola pieces, where the composer-led version on CRI CD 620 goes unchallenged.) Investigations, an uncommonly concise (7:25) essay for mixed sextet, is a recording debut. Individual entrances and tones are frequently hard to distinguish, which Feldman would no doubt applaud. Attractive digital sound (and silence). Perhaps Lachenmann (born in 1935) identifies traditional music sentiment with fascism. In any event, he gives it a remorseless trashing. Reigen seliger Geister (Dance of the Blessed Spirits, 1989) is his Second String Quartet. The historical genre appears only via rejection; normal bowings are truncated or distant, as if heard from a weak FM signal. Lachenmann’s methods lie elsewhere: abusive pizzicati, buzzsaw detunings, drawn-out gray noise, insectile murmurs and rustlings, vapor-trail harmonics. Again the Ardittis are peerless, making the 28:56 itinerary highly listenable, even gripping. Tanzsuite mit Deutschlandlied (1979-80) takes the orchestra on a similar trip. The sour horn licks may seem a debt to Spike Jones, but for Lachenmann demolition is a serious business. Rhythms outline the various dances, and sometimes (as in “Tarentella”) the ensemble turns into a swaggering juggernaut. Olaf Henzold and Deutsches Symphonie-Orchester Berlin respond fearlessly to the unusual demands. Initially this was “Helmut Lachenmann 1” (of three) on Montaigne, and it delivers a solid purgative kick. But I’m left craving a five-course musical feast.